Villa Fedra is a family owned luxury holiday home with private pool and front-line sea views. The villa is south-facing and bathes in glorious sunshine all day long. The pool and terrace are very spacious with a shady dining and sitting area and the large sun deck offers unlimited sea views. Our island home is set in 615 square metres of landscaped gardens (including 139 square metres inside). The contemporary and uncluttered interior can accommodate 6 guests in 3 air-conditioned bedrooms, 2 with balconies offering sea views. The villa enjoys Wifi throughout. 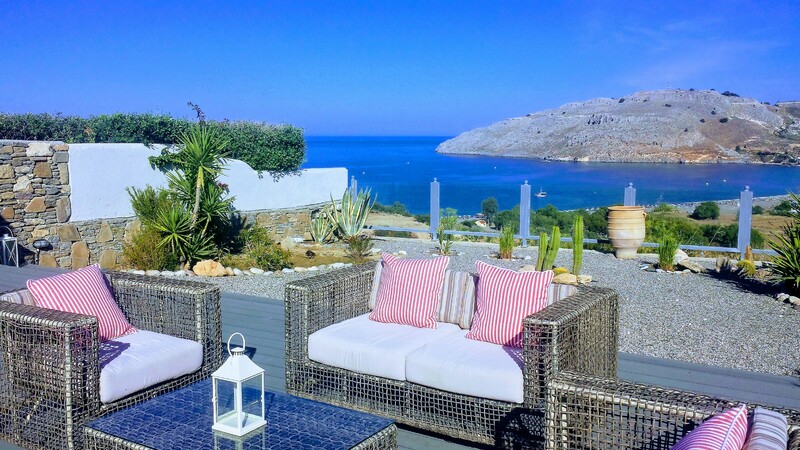 The unlimited sea views, spacious bright interior and modern design provide an ideal setting for those seeking style, comfort and relaxation in a luxury villa in Rhodes close to Lindos. This rental accommodation is thoughtfully designed and tastefully furnished in an uncluttered contemporary style with original artwork and all-white walls offering a cool retreat from the summer heat. Gather your loved ones, pick the date and enjoy! Contact us today for availability - we are booking into 2020 . Vlicha Bay is an unspoiled beach resort on the outskirts of Lindos. Set in the sweeping bay, Vlicha has a lovely uncrowded beach, ideal for families and beach lovers that are looking for a quiet but not isolated holiday and is a great alternative to the three bays in Lindos. We especially like the crystal clear waters that this beach has to offer. This small resort offers everything you need for a peaceful and relaxing holiday. Within 7 minutes walk of the villa you have Flavaris supermarket, offering a delicatessen, butcher and a full range of groceries, wines and spirits, next door is a specialist bakery. Vlicha Bay offers a great location for those wishing to explore the enchanting white washed village of Lindos, within a five minute drive, a further 10 minutes brings you to Pefkos. Lardos is also only 10 minutes drive from Villa Fedra, offering a wide selection traditional tavernas and bars set around the village square. 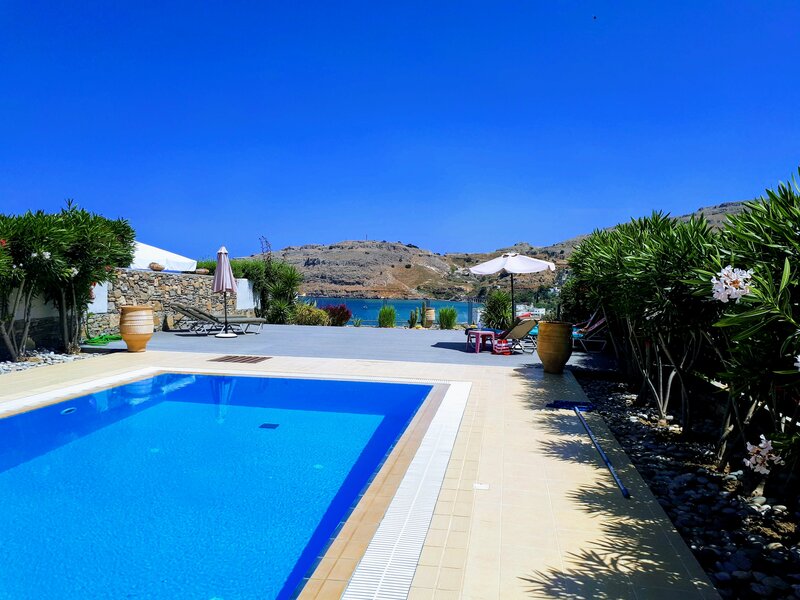 Lindos Villa Fedra will provide the ideal rental accommodation for people who set high standards for their holidays and who wish to combine relaxation in an enchanting place with comfort and luxury. 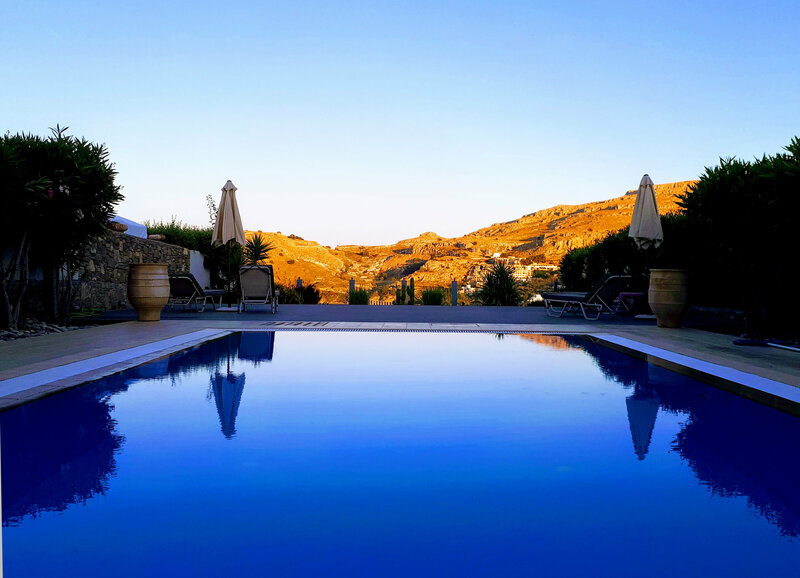 You will be ideally placed to enjoy the delights of the nearby historic village of Lindos. 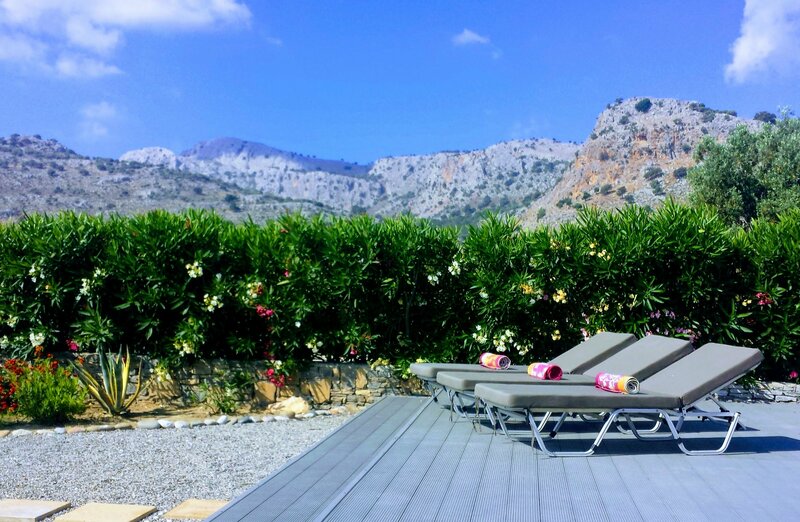 The south facing garden is planted with fruit trees, flowers and aromatic plants together with the mild climate and the amazing scenery make this rental accommodation in Rhodes a perfect place for early and late season vacations. We are delighted with the outstanding feedback we have received 2018 (check out our 5* reviews on VRBO/HomeAway #170856). If you would like to secure your 2019 summer holiday, don't delay, take advantage of lower flight prices. Bookings made direct with us will be at a lower rate and not subject to the online booking 'service charges'. "...an outstanding villa. 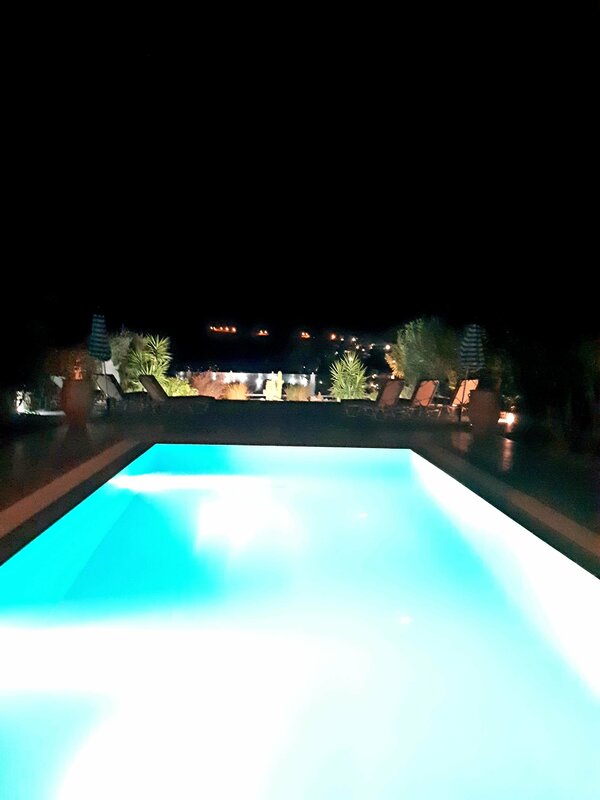 Everything was immaculate and the pool and views were amazing just as in the photos. 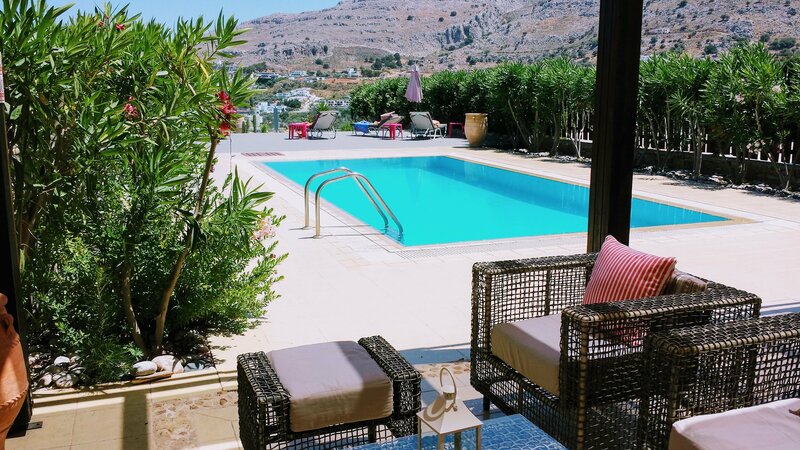 It was a perfect choice villa about a 10 minute drive to the centre of beautiful Lindos. The villa is well equipped for a relaxing stay and has great air-con and wifi. There was a welcome pack on our arrival which was also a nice touch. The Villa is in a great location with a supermarket just a few minutes away."